In the coming months, the EU and Lebanon will agree on more detailed plans for the implementation of their partnership for the coming years. 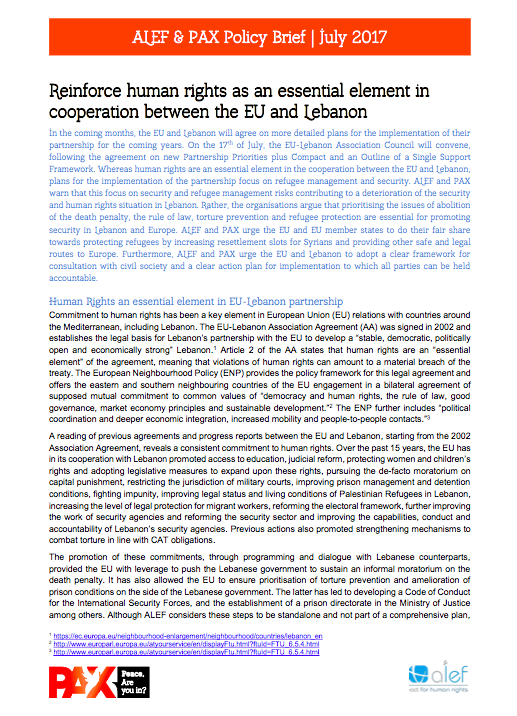 On the 17th of July, the EU-Lebanon Association Council will convene, following the agreement on new Partnership Priorities plus Compact and an Outline of a Single Support Framework. Whereas human rights are an essential element in the cooperation between the EU and Lebanon, plans for the implementation of the partnership focus on refugee management and security. ALEF and PAX warn that this focus on security and refugee management risks contributing to a deterioration of the security and human rights situation in Lebanon. Rather, the organisations argue that prioritising the issues of abolition of the death penalty, the rule of law, torture prevention and refugee protection are essential for promoting security in Lebanon and Europe. ALEF and PAX urge the EU and EU member states to do their fair share towards protecting refugees by increasing resettlement slots for Syrians and providing other safe and legal routes to Europe. Furthermore, ALEF and PAX urge the EU and Lebanon to adopt a clear framework for consultation with civil society and a clear action plan for implementation to which all parties can be held accountable.